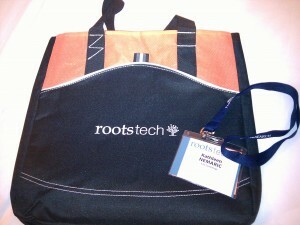 RootsTech 2012: Day One. Kid in a candy store. With bag, conference guide, attendee name tag, water bottle, jacket, cell phone, iPad, Bluetooth keyboard, camera, and RootsTech app, I was ready for the first day of madness. Jay Verkler, former President and CEO of FamilySearch, opened with a keynote speech that spoke to our genealogical future. The technologies we’ll need have yet to be created, and will require a cooperative effort from societies, archives, companies and users. We were treated to a video vision of “Emma” from the year 2060, who easily called up family information on her iWall to complete her AP Family History homework assignment, and later shared it with her friends on FaceBot. The rest of the day’s activities consisted of attending sessions (so many to choose from! ), and visiting the Exhibit Hall, which had more than 70 genealogy exhibitors in attendance. I got caught up in trying to visit a specific number of booths in an attempt to earn a free t-shirt, but the hall was so busy that it was overwhelming. I hardly knew where to turn, and I didn’t want to miss anything. I decided to forget about the t-shirt and come back later when the hall was less crowded – like maybe the next day. I was exhausted and exhilarated at the same time, and by the end of the last session, it was time for dinner and desperately-needed sleep. Oh, but in between dinner and sleep, we were treated to a comedy performance by Ryan Hamilton, courtesy of brightsolid, one of the major RootsTech sponsors. My sides were aching all evening and I could have used some tissues to wipe my tears of laughter, rather than my shirt sleeve.